The standard Encore forend screws (one long screw, one short screw) fit the Encore Rifle Forends (Not the Pro Hunter Rifle Forends) The standard Encore Pro Hunter screws (two long screws) work on the Encore Pro Hunter (Flex Tech) Rifle Forends. 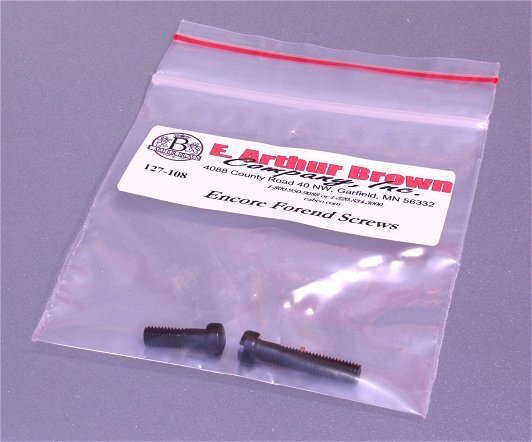 New forends already include these screws so, if you are ordering a new forend, you do not need to order these screws. We offer them only because the screws sometimes get lost and customers need a replacement. These screws do NOT fit muzzle loader nor shotgun barrels or forends. The replacement screws worked perfect. Fit my Encore forend and work perfect. Perfect Fit & Very Fast Order/Shipping Process ................Thanks EABCO !!! These were exactly as described and what I needed. Thank you for carrying hard to find items for my TC products.